The internet makes many everyday tasks faster and more convenient, like shopping and banking, but it’s important to be safe and responsible online. Social engineering manipulates people into performing actions or divulging confidential information. Similar to a confidence trick or simple fraud, the term applies to the use of deception to gain information, commit fraud, or access computer systems. Phishing: a ‘trustworthy entity’ asks via e-mail for sensitive information such as SSN, credit card numbers, login IDs or passwords. The link provided in the e-mail leads to a fake webpage which collects important information and submits it to the owner. Do not open email attachments unless you are expecting the email with the attachment and you trust the sender. 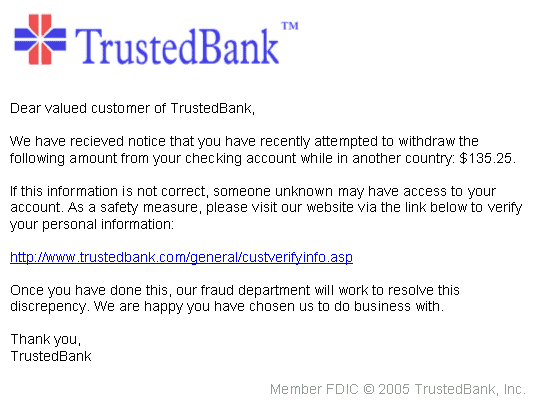 Do not click on links in emails unless you are absolutely sure of their validity. Only visit and/or download software from web pages you trust. not guessable by any program in a reasonable time, for instance less than one week. Beware that someone may see you typing it. If you accidentally type your password instead of your login name, it may appear in system log files. I have been a customer of FNB Oxford since 1978 and it goes without saying I wouldn’t bank anywhere else.